After disaster, there’s not much that anyone can say. Everyone is devastated, most people have lost quite a bit, and everyone just wants to mourn, and then rebuild what they’ve lost. In times like this, it’s’ important that your community has local roofing companies that can help them to rebuild. Whether it be water damage, or any number of other types of damage that may have happened during the disaster, a roofing company can help make the families whole again. Here’s how they do it, and why they do what they do. The fact that everyone needs a roof over their head is always going to be true. Unfortunately disasters happen, after a flood, or a fire, or an earthquake, there is so much destruction. Roofing companies provide the opportunity for the people that are affected to regain a sense of normalcy after everything that’s happened. The good news is that most people have insurance that will cover the cost after a disaster, so the roofing company can come in and help those that are so in need of it. This is the kind of community outreach that both rebuilds communities, and helps people get on with their lives. It’s a fast paced world, and more and more trade careers are falling by the wayside in favor of the full college experience. For that reason, we don’t have enough people that can help after a disaster. The roofing company provides the service and skill that’s needed to help people get back on their feet after something awful happens, and get back to living life on their own terms. It’s a sense of pride that comes with being a roofer, you truly rebuild lives as much as you rebuild homes. The thing that most people are impressed by when they’re hiring a roofing company is how much storm damage that they can fix. Many people are aware that water damage is one of the most disastrous types of damage that your home can experience. It truly ruins the structural integrity of your home in a way that many other types of damage can’t What a roofing company does is come in and repair that damage, make it better again, and get your home back in proper working order so it’s safe for you and your family. Remember, water damage that goes unchecked will eventually give way to mold in your home, which can be unsafe for the people inside of it. You need to make sure that you fix the problem as quickly as possible to make sure that you and your family are safe. For many people, the pride of a hard day’s work comes from making something. Roofing companies take that a step further. 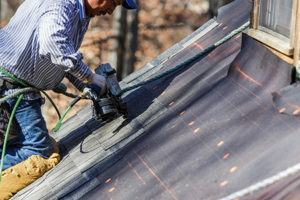 Not only does a roofing company make a roof work again, it also rebuilds the thing that’s probably one of the most important things in the world for the person that’s fixing it. Roofers do more than create, they rebuild. That’s one of the most valuable things that there is, especially after a disaster. At the end of the day the people who work at All Storms (and other roofing companies) are exactly that – people. We understand that you need a safe home for you and your family and only leave you with a level of work that we would proudly display on our own homes as well. The difference between a good and a bad roofing company is easy to tell, one is in it for the cash grab and one is in it for the long haul.